Just to let you know our Doody is happy & healthy nearing his second birthday 12/09/15. 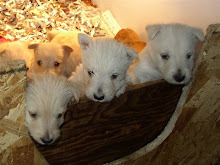 His two playmates are Nikki & Scottie both Cairn Terriers. They all have a large fenced backyard 120' x 80' to run. Never on a leash. Our four legged kids get the best of everything. Will get a few more photos soon.